Noah was lazily waking up from his nap, I was finishing a couple of blog posts, Ali was having quiet time, and Chris was out running. It was a calm, lovely day. Noah started moaning, so I went to retrieve him. He was crying by the time I arrived, which led to cuddling. He explained between hiccups that his eye got poked. Upon further discussion, he told me that he poked his eye with his finger. I looked up and saw the shadow of a flutter. At first I feared my arch-nemesis, a flying roach. But that’s only because the object moved too quickly out of my peripheral vision for me to realize its size or shape. I adjusted my vision, looked again, and wished it were a flying roach. It had at least a twelve-inch wingspan. And silent, chill-inducingly fast-flapping black wings. His swoop descended and circled, ever closer to the level of my head. I shoved Noah into my chest and let out sounds that had previously only been uttered by a hyena immediately before being eaten by a lion. I ducked and ran-fell out of the room, bashing Noah into the footboard as we careened into the hallway. Both Noah and Ali began crying as I slammed his door, flung open the linen closet, and stuffed an undeserving beach towel under the door. I uncalmly tried to explain between hyperventilating. Wheezing and shaking, I somehow managed to transfer myself and my family down the stairs without passing out, falling, or throwing up, thanks in full to the fact that I am on pulse-regulating heart medication. We all silently walked to the kitchen and stood at the top of the basement stairs, waiting for Chris to get home. After a few minutes, he rounded the corner, beaming and energetic from a beautiful Autumn run. I studied Chris’ face as he processed this revelation and mentally changed gears from the evening he thought existed. I’m not sure I said anything, perhaps muted forever by the traumatization. 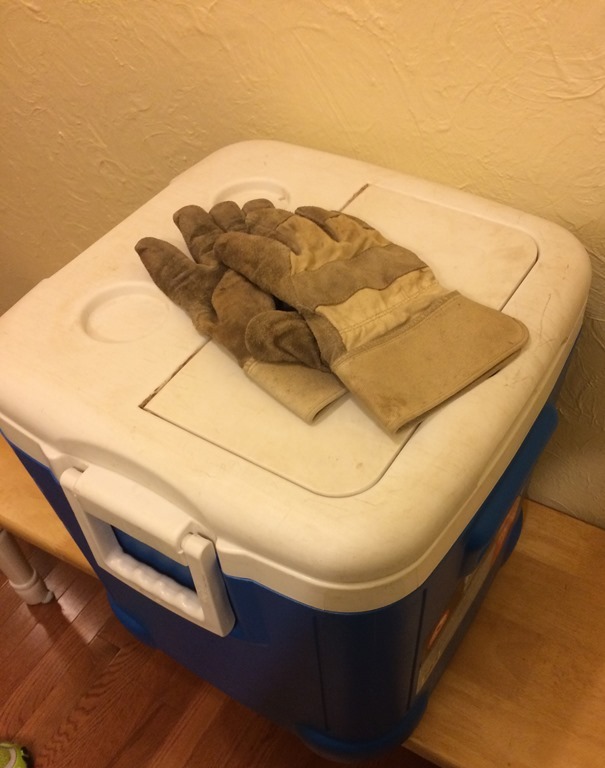 He descended back into the basement where he Googled “how to catch a bat” and collected his supplies: an ice chest, old towel, and work gloves, then came upstairs to select the tallest piece of Rubbermaid from my kitchen. I nearly choked at the thought. How nice THAT would have been. Then he went to the bathroom. It’s always best to thoroughly empty oneself before facing a flying rodent, he later explained. I can’t say that I blamed him, and wished I’d been afforded the same opportunity. I tried to calm myself, sitting on the couch with the Starbucks Chris had brought me from his run, telling myself that everything was okay. SURELY the bat hadn’t been present for Noah’s entire nap. And if he had, then CERTAINLY he hadn’t touched Noah. Stupid heart pills. Try as I might they wouldn’t let me die. He’s just two. He’s lying. He’s getting his stories mixed up. He’s being silly. He’s using his imagination. It isn’t true it isn’t true it isn’t true it isn’t true it isn’t true it isn’t true it isn’t true it isn’t true it isn’t true. I swallowed a liter of bile and nearly tore a hole in the couch with my nails, willing my brain to forget what it had just heard. Chris finally returned, seemingly fully in tact, cooler in hand, and perhaps a bit more testosteroney than when he left. He led us all into the bathroom and shut the door. With much pride, he sat down his cage and removed his manly gloves. He then opened the cage. 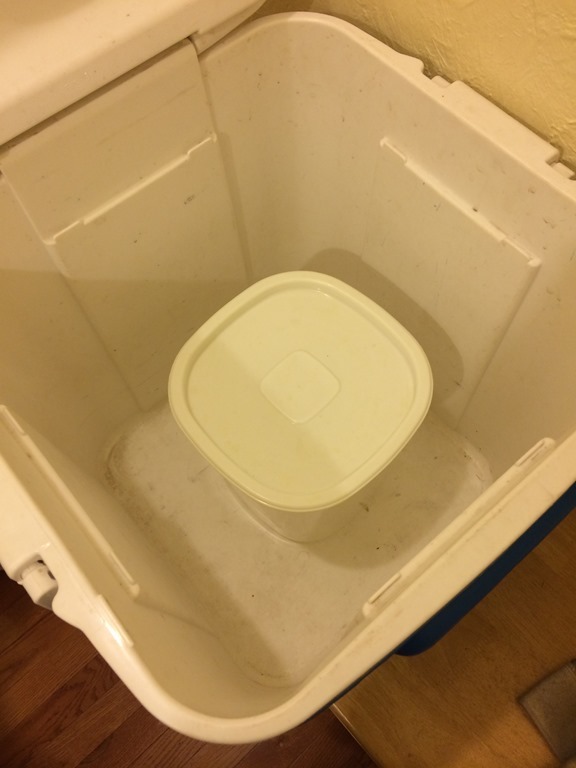 He checked the lid’s seal twice, then exhumed the container from the cage, and set it on the bathroom counter. The depraved villain straight from the warmest Port-A-Potty of Hell bared his yellowed fangs straight at me. The claws on the tips of his wings were more disgusting than a toddler’s fingernails after playing in his own feces, and his back fur was wet, as if he’d recently peed himself. And my eyes had not deceived me. He was larger than God should allow any bat to be. Chris, not yet having heard Noah’s story change, was insanely proud of himself. He went in search of the appropriate prop for his instagrammed victory over the nefarious villain that had entered his domain and threatened his family. I would have been more impressed if he’d had to face the bat mid-flight like myself, rather than just covering him with the bowl and plucking him off the ceiling. But if that had transpired, I seriously doubt we would have had our prisoner. And after all, Chris was fantastic. He took control of all the things my trauma still disallowed me to do, such as sticking the children in front of a movie, giving them leftovers for dinner, and eventually putting them both to bed in Ali’s room (there was no way anyone would be sleeping in Noah’s room that night) while I frantically left a message for Rid-A-Critter to come check for more, and went through Noah’s story with Chris and all of the what ifs that had been ping-ponging in my mind. I reassured myself with a thorough inspection of Noah’s face and head, and found nothing. Then I deassured myself by reading on the CDC website that bat bites are undetectable. It was at that point that I lost at least two more years off the backside of my life. I emailed my Pediatrician to see what she thought I should do. HOLY CRAP, JEFFERSON COUNTY. THANKS A LOT. I mean. Could they not have said “Rabies Capital of America”? Surely there was more Rabies in The Congo than in central Alabama. Right?? They had a phone number listed, but it was Sunday night and our county isn’t exactly known for its efficiencies. But I called it anyway. What the heck. I’ll try it. I told my story to the person on call. She took it very seriously and said she’d have someone call me. 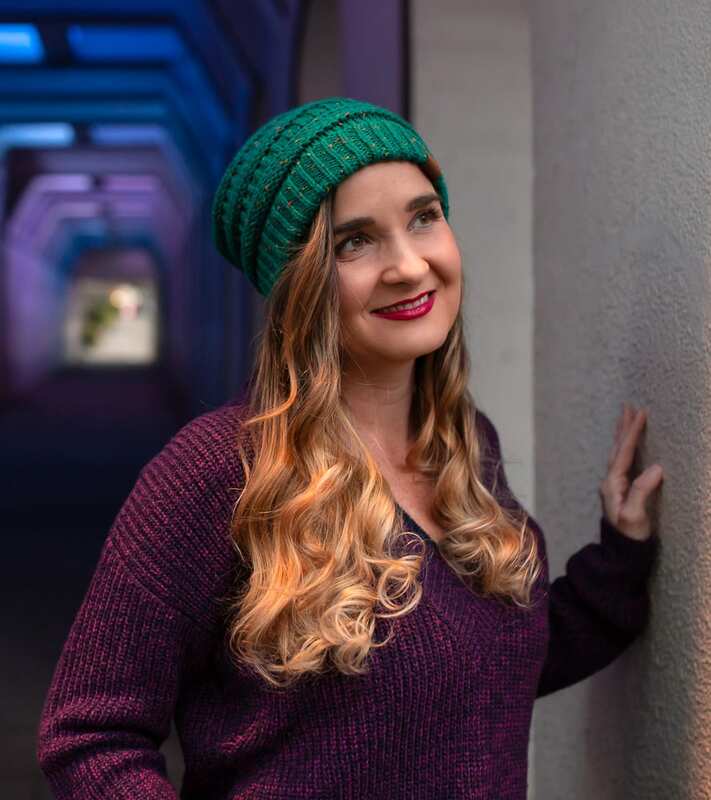 I told my story to a nurse at Children’s Hospital. She sounded grave and said she’d have someone call me. I told my story to Rabies Control. They told me to refrigerate the bat (not freeze, please), and bring him to the Jefferson County Department of Health at 7:45 in the morning where we were to ask for J.C. Andrews. They would overnight the bat to the lab and we would find out the results on Tuesday or Wednesday. These are the moments that one can truly appreciate having a basement refrigerator that houses nothing but canned drinks and the occasional possibly rabid bat. Not that I’ll ever drink Sprite again. But at least I don’t have to burn my Greek Dressing and cheese spread. I was not in my best mood the next day. Chris and the bat set off early to go find the elusive J.C. Andrews. 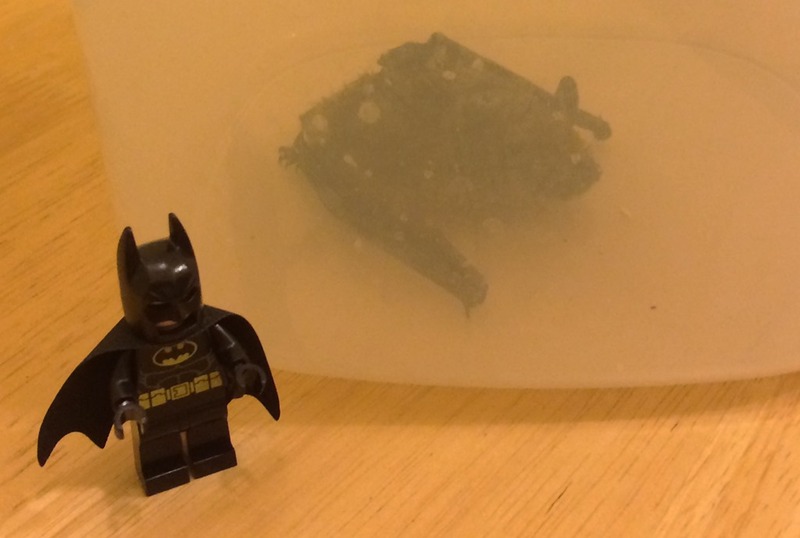 On the way, my parents called him and said that they wanted to drive the bat to Montgomery and hand-deliver it to the lab to skip the shipping time to make sure Noah didn’t have to start the rabies vaccine unless absolutely necessary. After receiving the requisite paperwork with multiple colored carbons from the DoH that is required to deliver a freshly chilled, potentially diseased flying monster to a secret laboratory, Chris met up with my parents at an undisclosed location to transfer the dangerous biohazard. Around nine that morning, I got a call from an extremely accusatory and suspiciously voiced woman at the Jefferson County Department of Health. I dutifully surrendered my rights and my address. We stumbled through the school day, waiting desperately for the lab to call us and Rid-A-Critter to dispatch. When the Batman did arrive, he climbed into the attic, and the first thing I heard was an impressed whistle. Two minutes and he was back down the stairs. He laid out the plan of cleaning up the guano and sealing up the holes and giving the bats a one-way exit (did you know bats are a protected species? Because they are) – so that they would have to find a new neighbor to tenantize. A little while later the State Lab did call and after a ridiculously long introduction and buildup, confirmed that there was no evidence of rabies in our bat, God Rest His Soul. 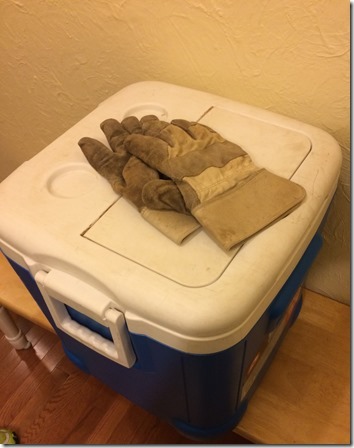 The next morning, my Dad returned the ice chest (but thankfully not the Rubbermaid.) Noah ran up to tell him the whole story. Next Post Birmingham Bucket List: Autumn Walks. Previous Post The Twelve Days of Facebook Christmas. When I was a teenager, we lived in a 100+ year old house in northeast Indiana, and we had bats. We never did get a professional out to look at them, but seemed like once or twice a summer one would appear, seemingly out of nowhere. One night I came back to an empty house with a friend and discovered one flapping around the dining room. So not only do I feel your terror, but hearing the Batman say what he did would be enough for me to move out until I had video evidence that the place was sealed. Wow. That would be seriously traumatizing! I think people are aware that bats are much more dangerous than they did back then – even their poop is bad for people to be exposed to. When we were kids, nobody realized that. Also, our house isn’t old. SO not fair that they chose us. …suddenly my water heater leaking and destroying the ugly linoleum doesn’t seem like the huge traumatic house-related emergency situation it was at 7 last night when discovered. Thank you for that. Seriously. I am feeling much better about this now that I have proper perspective. Ha! You’re welcome. Now where do I go to find my perspective? I’m dying. Literally have goose bumps and the heebie jeebies right now. Thanks! So. You’re saying you wanna come over and visit? I almost did that night. But the thing was, Noah’s room is the only room with attic access – it has two side doors that go into eave storage that are open to the attic. We jammed those doors up with towels and jammed his room door up with towels, so I knew they couldn’t get back in the house. But I still wanted to leave. I’m glad you didn’t literally die from fright. That really is the silver lining, for sure. At least now we know we have a problem that needs to be addressed. Our budget doesn’t appreciate it, but oh well. The joys of home ownership. I have to say: I fully expected a new bump on your head to be part of this story. So the fact that you escaped physically unscathed (although emotionally scarred for life) puts it firmly in the Win category for me. There are tons of bats in our yard and I don’t like them one bit. The bat must have been scary but waiting for the rabies results must have been worse. I am glad your son is okay. Not to make you worry, but do you know where they go when they’re not in your yard? You might want to get your attic checked, too. We had sorta the same thing happen with flying squirrels. I thought it was serious annoying but harmless, really, as we were catching them every night for a week. Then I googled it and was certain we’d all became Typhoid Mary. Ugh! 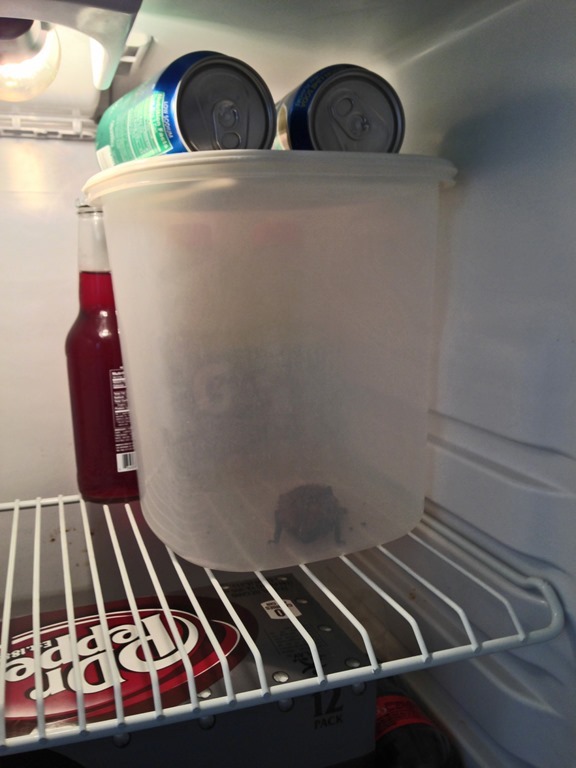 Had a bat fly out of MY CLOSET one night. I’ll just say he was inhumanely disposed of by my husband. The humane bat people said walk outside at dusk and look up – that’s when the bats fly out for the evening (shudder). We never saw another one again, but when we sold our house the inspector found enough guano up in the attic to cost us nearly $2,000 to have all of the insulation material replaced. I can’t even look at your bat photos without reliving the terror. Luckily our daughter was asleep in her bedroom when it happened (her door was QUICKLY closed). Yuck!! Ours is costing us a good deal, too. But at least they’ll be gone. We only bought our house 6 years ago and nothing showed in the inspection at the time, so they must have moved in at some point in the past several years. Your life is never boring. OH.MY.WORD!!!!!!! STOP IT!!!!!!! I can not get over this story. So bizarre & TERRIFYING! I’m so glad that Noah is ok! So, how long until all of the bats are out of your house? Wow…..Bless your heart (literally). They come back on Monday to seal all the vents and put in a one-way exit for the bats. Then four weeks after that, they’ll remove the exit and clean up all the guano. It’s quite the process. OH. MY. WORD. Not to make you feel worse, but I think I’d have to move! I hope your batty friends will be gone soon! The thought most certainly repeated itself over and over on Sunday. But I love our house and HATE moving, so we’ll get rid of the bats and recover from the trauma in due time. Once upon a time when I was 11 years old, I was outside (in broad daylight) playing with our cats. All of the sudden, completely out of nowhere, something black swooped down and landed. ON MY ARM. At first I didn’t know what it was–I was too concerned with frantically flicking away that black creature clinging to my arm. Yes. I had to flick him off. In the midst of my hysterical screaming I assessed the situation and saw black wings. A bat. So I ran inside screaming and somehow explained to my mom what happened. The first thing she asked was, “Did it bite you?” I looked down at my arm, and although it was a little red it didn’t hurt. I think it was red from me subconsciously rubbing it to get rid of the clingy bat feeling. It mostly just scared the crap out of me. My mom went outside to investigate, and I reluctantly followed. We found it slowly army crawling across our deck. We concluded that there was probably something wrong with it. My cat came over to investigate as well. Then my cat ate it. He ate the bat. And that was the end of that. Oh my goodness!! This is horrible. Horrible horrible. I can imagine that was traumatizing for quite a while! It was awful. But honestly, I think I’d take a bat on my arm over a bat (especially many bats!) in my house. So awful. Anyway, welcome to the traumatized-by-bats club! I hope you don’t have any more issues with them being in your house. Oh. My. Gosh. Seriously your life is fascinating. How the heck do these things happen? I hope they leave soon. One time we were infested with mice. Nine of them and they were making babies in our couch. I was sleeping on the couch and a mouse started chewing on my hair. I didn’t sleep for two nights. My husband didn’t believe me, but I saw it run off. So creepy! Thank goodness Noah doesn’t have to get shots. You need a vacation while they leave!! Okay that might be worse. Yes, that IS worse. If I ever wake up to a rodent chewing on my hair, I think I’ll have to take a rocket to space. I’ve already told it NOW….Oops. I feel your pain. I’ve had too many run-ins with bats at my house. The first time was one evening as I was watching TV. I heard our cat come down the attic steps – it actually sounded like he rolled down the steps. That got my attention, but I didn’t think too much of it. Moments later, I saw what I described to my husband as a great big mutant cricket on the floor, against wall, beneath the TV. By this point, I was crouched up on the sofa, with a blanket covering my head and body. I sent my husband to the kitchen to get hot dog tongs to remove the bat. Apparently my cat had roughed him up a bit. After taking the bat outside, my husband asked me what he should do with the hot dog tongs. I told him to throw them out in the outside trashcan. He didn’t think I was serious, but it didn’t take long for him to realize I was deadly serious. A few years passed and we didn’t see any more signs of bats. Until, oh, until one evening I was in and out of the attic getting our camping gear for an upcoming trip. I had made several trips to the attic and left the attic door open. When my husband and toddler son came home, I was talking to my husband in the hallway by the attic door. I felt something on my back and reached back with my hand. When my hand felt something, in that split second I knew that I should not be feeling anything on my back, I flung my hand down. It was a bat. ON MY BACK. I HAD A BAT ON MY BACK! When I flung my hand down, the bat went with it and was flung to the ground. Of course that was the moment my toddler decided to come into the hallway. The bat was not moving AT ALL, but still I started screaming at my son to GET OUT! *sigh* Then I started jumping up and down in hysterics yelling, “ARE THERE MORE? ARE THERE MORE? ARE THERE MORE ON MY BACK?” My husband assured me there were no more bats on my back, and removed the bat to a tree in our yard. He returned to the house to accuse me of hurting the bat. Seriously!?! 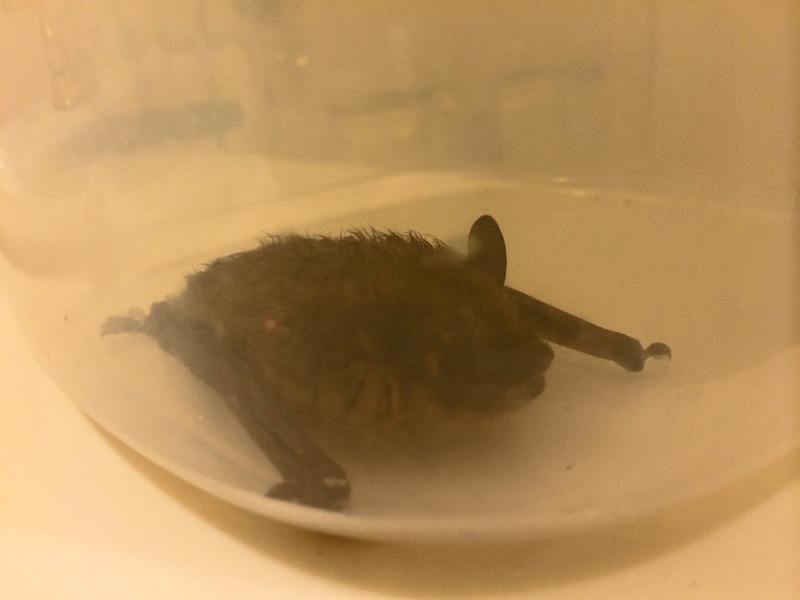 I just had a “near death” experience with a bat and he was all gloomy that the poor, little bat was injured. Okay this is WAY worse. I’m glad y’all finally made them leave! And I need to know more about your husband to make this story make sense. Is he a…. Oh, bless your heart. And when will you be moving? Just the closeup PHOTO of the bat was enough to traumatize me for life…I can’t imagine actually having the live version of the accursed thing in my presence. It makes me a little dizzy to think about it. RATS WITH WINGS AND FANGS. The thought occurred to me, for sure. Unfortunately, I love our house. So we’re just spending a house payment’s worth of money to ask them to leave. I think “burn it with fire” applies here. I don’t know. A bat flying around with flaming wings?? Now I’m going to have new nightmares. I think I just lost 6 months off my life simply by reading this. Holy Cow. The Good Die Young. What can I say? Where did I get the idea that bats would be cute mosquito eaters? Because I sure as heck was wrong about that. I think I’ll have the heebie jeebies all day. I think some are “cuter” than others. Ours was not at all of the cute variety. Needless to say i now dislike having blankets over my head, scream hysterically whenever i see a bat, and grew up to LOVE Badminton (even played on the team in jr. high and high school!) I cannot stand bats. One flew into our first house here in Mozambique and i screamed and screamed so much that our neighbors came over bc they thought I had found a dangerous snake… when they saw it was a bat they just started laughing. Apparently not everyone has such a paralyzing and hysterical fear of bats! Wow! I’m glad you’ve been able to trace so much of your personality to one event. Hilarious and horrible all at once! This is the most terrifying story on the interwebs. When we worked in Alabama’s parks, we frequently encountered these things in old attics and barns and what-have-you . . . the frequency of the wifi radios seemed to excite them. I’m sure that State Park bats were completely civilized and never caused any mischief. Boy Scouts, I bet. We have bats in our neighborhood. I love watching them at night flying OUTSIDE and eating all the mosquitoes, but I’m pretty sure I would need to borrow some of your medication if one ever got into my house. My black lab would probably have a great time trying to catch it though. Oh my gosh! I am thoroughly impressed with you, your kids, and your husband. I’m pretty sure I would have just died right there and then. I nearly had a heart attack last week when I found a cockroach in a box at work! You have a very brave family! That’s one of the scariest stories I’ve ever read. Thanks! I think the kids were the bravest of everyone, actually. Reminds me of the time my oldest daughter came into our room one night and told us she thought there was a luna moth in her room (she was learning about them in school). Her dad took her back to bed but she returned a little while later and it was my turn to take her back to bed. I laid down to help her get back to sleep when something swooped by my face. There was no screaming but I was out of that room in a heartbeat. Unfortunately, I left my daughter in the dust so I had to go back and get her. That was not a proud parenting moment. :-P Of course, my husband didn’t believe us until he was on the couch the next evening and the bat did a dive by on him. We still joke with my daughter about the luna moth and she’s 21 (thankfully she doesn’t remember me ditching her). Hopefully you’ll get to a point where you can laugh about it but I’m sure that will be many years down the road since you had the added trauma of worrying about rabies. That’s scary. So. What you’re saying is. That bat just hung around in your house for 24 HOURS??? I think bats swooping could be great speech therapy for anyone. Hard not to utter at their sight. My wife would have made me sell the house!! Way to be a trooper!! Then my husband reminded me I’d made him promise to never move again. Wow. That’s why bats have never bothered you – we definitely inherit our parent’s phobias or lack thereof. Oh. my. word. Best line is the one about the “warmest Port-a-Potty of Hell.” I think this is the only post where I have laughed out loud and also shivered in nameless fear….a bat poking my son’s eye?!? AUGGGGHHH!!! I would move and let the bats have the house!! In my family we would have been shrieking, yes, but more along the lines of “Wow! How cool is that!” and “I want to be the one to catch it!” or “Can I keep it as a pet? Please, please, please!” And then mom would have helped us catch it and we would have kept it in a box or something to show dad when he came home from work. Ha! Well, since we do, after all, live in the Rabies Capital of the World, I think all of us Birminghamians were brought up with a healthy fear of all things bat-related. But I do try to breed the fascination with all other types of wildlife. Except for roaches. Never roaches. I enjoyed your humor, as always, but this time the funniest part was watching my sister struggling with how to post a kind comment that nonetheless conveyed how irritated she was with your ludicrously overdramatic panic in the first half of the post. We sold our house a year ago……after finding out that what we heard in the walls were bats, but before the bat guy came out to seal up any holes and install the one-way doors. We told the new owners about it before the sale. Long story short, bat guy came and did his stuff and everybody thought things were hunky dory. Then I got a text from the new homeowner about 6 months later (the night before Easter) saying they had bats flying around in the house. Their daughter woke up one morning with a teeeny scratch on her face so the whole family had to get the rabies shots. She said they were terribly painful and there was a problem with the last shot so everybody had to get that one over again. She said her kids freak out every time they go by the hospital. When we were living there we first thought it was mice we heard in the walls and my daughter was freaked out. When she found out it was bats she felt better. Whaa??? Mice with wings?? Glad you all survived and didn’t need the shots! Oh my goodness this is terrifying!! I am SO glad we didn’t have to get the shots. They’ve got to be the worst medical treatment ever! OH MY!!! I’ve had mice, roaches, snakes, birds, chipmunks, squirrels, owls, fox, deer, coyotes, but no bats……yet. Let’s hope you never do! Ugh! I totally feel your pain and I know exactly how you feel! we killed 8 bats that got into our house before we finally figured out how they were getting in and got it closed up! Not fun! One of them my daughter found hanging out on the bottom hinge of a closed bedroom door – my baby was asleep in the room and I knew I was going to have to take care of the ugly bat because I would have to get in there when she woke up! I grabbed a dirty bath towel and used it to grab the bat – threw the bat in the toilet and flushed it! 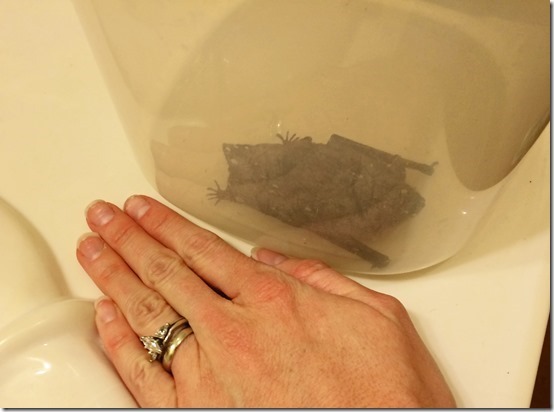 it was every bit as big as your bat – I didn’t know they could get that bit – I’m so thankful it flushed down with no problems!!!!! Ack! That’s horrifying. 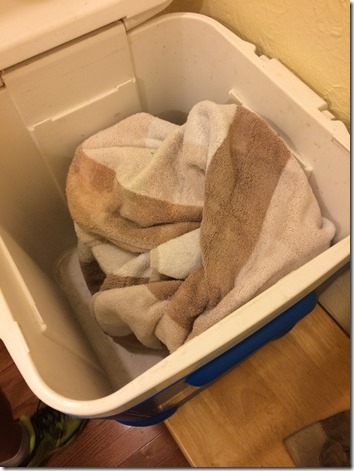 And yes, the flushing does seem rather unwieldy – I’m surprised it went down! This is why I always read your posts in the morning. Because when I put it off and read it at night, you give me nightmares. I’m glad Noah is ok. I’m still scared though. How soon until you know 100% the bats are gone? They’re coming tomorrow (Monday) to seal everything off and only leave a one-way exit for four weeks. So it’s quite the process. But we have the inside of our house fairly well sealed off so they can’t get in again, and the bat guy assured me that they didn’t WANT to come in our house. Oh my word. I would have DIED. WOW. How on earth do they think it got into his room? I’m glad you were able to have it tested and not put your sweet little guy through such trauma. Where in Jefferson County do you live? 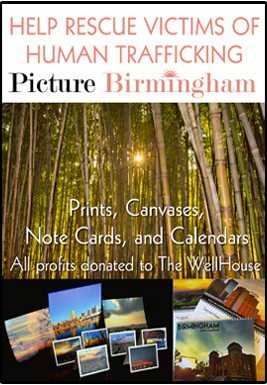 We are originally from Birmingham! We live in Montgomery, now. I had no idea it was once the rabies capitol of the world! Scary stufff. I read a horror story about a child who was bitten, (a teenager actually) and they didn’t realize it until it was too late. Smart parents!!! SO glad you’re all okay! His room has little doors that go to attic eave storage on either side and open up into the attic. So actually, his room has attic access. We’ve had those doors blocked off ever since! I too had a bat infestation in a house I USED TO live in. At 11:45 one night the FIRST intruder made himself known. I say first because sadly there were more that managed to transition from their dwelling in my attic to the world below where I lived naive and formerly unaware. As it turns out, not only are they endangered and thus protected from being killed, they are just about given candlelight, Barry White music, and an armed guard to watch over them when it is their mating season. And guess what time it was when mine were discovered? Yep. Sometime I will have to tell you the whole story, but it ended with the 75+ bats getting to keep my house as their own little brothel and I moved out that night never to live there again. And I’ve hated them with the fire of hell ever since. I DO need to hear this story in entirety. You moved out THAT NIGHT? Amazing. I’m assuming you went back for your stuff later. Or…not? 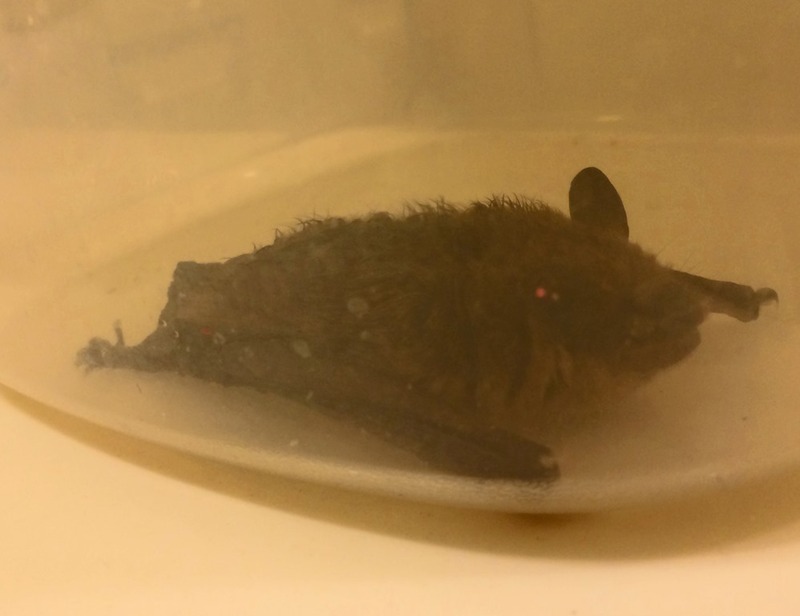 I left the night I was informed there were 75+ more making bat babies in my attic and that their guano could kill me … Not the night the first brave one ventured south into my living space. Sadly I lived there for a couple more weeks genuinely convinced there weren’t anymore. Imagine my surprise to learn there was an entire village of them up there. My stuff stayed with the bats until I found another permanent place to live then I went back and got it all … during the day of course. Yeah, the guano. I’m hoping we all live for four more weeks until he comes to do the final clean-out. I’ll keep you posted. Do your kids watch Wild Kratts on PBS? They have an episode on bats and how to make bat houses for bats to sleep in.! Maybe bat houses keep them away from human houses? Our neighbors would probably appreciate us if we put up bat houses – it’d keep them from taking up residence in their houses! Call me weird, but I felt a little bit sorry for your bat. You mentioned he flashed his fangs at you while he was in the container….does that mean he suffocated/froze slowly to death in your fridge? I totally get that – I felt sorry for him too. If he hadn’t had the opportunity and suspicion of coming in contact with our toddler, we would have let him go. But once we reported it to the county, they were seriously Big Brother about the whole thing – calling my house every morning and requiring follow-up and paperwork…they’re the ones that told us to put him in the fridge, which incidentally is warmer than it is in our attic some nights. He was alive when we delivered him to their lab. Unfortunately, they have to kill animals to test for rabies (because it’s not in the blood, only in the brain), but due to the fact that our county was formerly the Rabies Capital of the World, they take those kinds of threats very seriously. I am so sorry for that. Just… WOW. TRAUMA. So I feel for you! WOW! Yes, that doesn’t sound like a good situation AT ALL. This just makes my chest hurt thinking about it! So glad that nobody was injured! Thankfully, we’ve never had bats, but at our old house, we had mice (they tend to run in when your bathroom is completely gutted to the studs/ground during the first cold spell of the season), and a snake (right after Hurricane Ivan). The mice were enough to make me want to burn the house down, but the snake was the icing on the cake! Rodents of any kind are so unsettling. oh my goodness!! I will admit I was cracking up at your post UNTIL I GOT TO THE PART ABOUT THE CRAZY AMOUNT OF BATS IN YOUR ATTIC!! OH.MY.GOODNESS!!! That is just insane! I’m so glad Noah isn’t going to have to go through all that due to rabies. I can’t imagine going through all of that with my own Son. And 2 years old, yeah you don’t know if they are telling a story or really saying what happened. Way to be immediately on top of it, I don’t know that I would have even thought of all that. I hope you update us on the bat condition at your house because WOW that sounds insane! Sorry you’re going through all of that! They’re coming tomorrow to begin the sealing-off process. Hopefully they’ll leave quickly! I’m a little behind on your posts and just got to this one. I have to admit I had to just skim read until I got down to the part where you talked to a health official and had the bat tested for rabies. I was having nightmarish flash backes to veterinary school where we were taught the bat in the bedroom rule: if a bats in the bedroom assume you were bitten and possibly exposed to rabies. I am so glad you are a smart individual and looked on the cdc and got everything taken care of, and that the bat tested negative. Now to get them out of your atic. You poor thing. I can’t imagine dealing with that. I hate/am now scared of bats because of vet shool! Yikes! Yes, I didn’t at first realize the potential horror, but it didn’t take long for it to catch up with me. So thankful that everything was okay!